"The most astonishing possibilities remain to be discovered in the raw material of the photograph"
Abstract photography is a term with ambiguous connotations, associated but not limited to the achievements of groups such as the Photo-Secession, Straight Photography, and New Vision movements. Since the late nineteenth century, photographers have been determined to match the formal and conceptual advances of other genres within Modern Art. The result is an extraordinary and varied body of work in which the compositional traits and subject-matter of traditional photography recede from view. Here are abstract photograms made without cameras by exposing found objects and treated photosensitive paper to natural light; surreal close-up and long-distance images, in which the details of natural or architectural patterning become abstract compositional motifs; and conceptual and installation-based works in which photography is incorporated into sophisticated mixed-media practices. One of the key advances of abstract photography has been the realization that cameras are not required to make photographs. In the early twentieth century, artists such as Christian Schad, Man Ray, and László Moholy-Nagy began to create bricolage-style works by placing found objects directly onto photosensitive paper, generating graphically-arresting images in which the everyday detritus of modern life is rendered luminous and strange. Since the early advances of Schad, Man Ray et al, abstract artists have continually returned to the "photogram" - the cameraless photograph - as a medium allowing for uniquely self-reflexive and creative interventions into the photographic form. Rather than capturing an image by the passage of light through shutters onto photosensitive paper, the paper itself is directly manipulated and treated - often brought into contact with other objects - allowing for a potentially endless array of effects. As a general rule, abstract photography has tended to avert its gaze from extraordinary and arresting subject-matter. Instead, it focuses on the irregular forms and impressions which can be generated by representing familiar objects in new ways: from Alvin Langdon Coburn's Vortographs, made using a camera lens adapted with fragments of broken mirror, to contemporary works by Walead Beshty, Liz Deschenes and others. It is impossible to evoke the spirit of abstract photography without mentioning the specific development of aerial photography, a method which now has a much wider currency across commercial and popular art. In the 1940s, however, when William A. Garnett began to photograph tract housing and machine-harvested fields from the wing of his domestic aircraft, the idea of photographing the earth from above was new and strange, in many cases producing surreal images which seemed totally disconnected from the subject-matter they represented. "Abstract Photography" is an ambiguous term, without a commonly accepted definition. Like abstract art, it has also been called non-objective or concrete, and like abstract art it occupies a sliding scale from broadly representational work with abstract elements to wholly non-representational images. It can also involve a wide variety of photographic materials, processes and equipment, and is not always created with the use of a camera. In many cases, it may instead involve the manipulation of photosensitive materials such as paper and cloth. This image, one of a number by Coburn seen as the first truly abstract photographs, consists of an intricate pattern made up of sharp diagonal planes. Converging towards the top of the photograph, they contrast with the compact crystalline shapes to the lower left. A sense of dynamic movement is generated, as light is embodied in multilayered planes which seem as tangible as the fractured object from which they are thrown off. Prior to his work as an abstract photographer, Alvin Langdon Coburn was associated with the Pictorialist movement, which sought to bring to photography the impressionistic and atmospheric qualities of late-nineteenth-century painting. He was also a noted portrait photographer, whose 1913 publication Men of Mark contained prints of a raft of venerable authors, artists, and statesmen. His Vortographs thus represent a pronounced turn towards avant-garde approaches later in his career, following his interactions with the artists and writers of the English Vorticist movement - primarily Ezra Pound - and his publication of "The Future of Pictorial Photography" in 1916. Photography writer Keith Davis describes Coburn's Vortographs as "the first body of artistic photographs in history to embrace total abstraction [...] the best of these Vortographs are quite remarkable: boldly composed, mysteriously unreal, and intensely vibrant with light and energy [...] These images are, most importantly, about the idea of form and power, and come as close as any ever made to giving pictorial expression to thought itself." Later photographers such as the Japanese Kiyoshi Koishi adopted Coburn's approach in works including Early Summer Nerves (1933), while Coburn's influence can also be sensed in the work of contemporary artists such as Barry Stone. Depicting an upturned table on a porch, Paul Strand's witty, improvisational photograph from 1916 emphasizes the interplay of geometric planes of light and shadow, the very banality of the subject-matter encouraging the viewer to focus on the abstract connotations of the image. A large pale oval fills the frame, bisected by sharp diagonal lines which divide sections of white and grey. The cumulative effect is of a sharply-focused image whose basis in reality is obscure. An early associate of the influential photographer and gallerist Alfred Stieglitz, the New York-born Paul Strand was a pioneer of both Straight Photography and the abstract photography movement that partly emerged from it. Like Stieglitz, he can be considered one of the most vital figures in the development of abstract photography during the early twentieth century, though his career spanned across a later period. Strand's work influenced a whole raft of artists who themselves made decisive contributionst to abstract photography, including Stieglitz himself, Edward Weston, Imogen Cunningham, and the artists of the San Francisco-based F/64 Group. Made on Satista paper - a substitute for platinum paper during the shortages of World War I - this particular print has an unusually subtle tonal range, evident in the dark flecks of wear and tear visible on the table's shadowed surface. This was one of many abstract images of everyday objects that Strand created at this point in his career, though he also remained a committed social documentarist throughout hist life, creating various extraordinary portrait series depicting life in different regions of the world during the 1960s-70s, from Ghana to the Outer Hebrides. The art historian Helmut Gernsheim has argued that "Strand brought a new vision to photography [...] Nearly all of his pictures broke new ground both in subject matter and presentation." With specific reference to the early part of his career, critic Richard B. Woodward adds that "[w]hether photographing crowds in a park or individuals on the street, apartment-house backyards, a picket fence, trains in a rail yard, or a still life of a jug and fruit, the young artist sought to bring out their abstract components." Christian Schad's abstract photogram consists of an overlay of various irregular geometric shapes, of differing shades and patterns, some marked with fragments of text or illustration. The white shape rising up through the center of the image, set against the brown patterned areas which also seem to float against the deep black background, creates a sense of rough, bricolage-style texture and depth. The scraps and cuttings take on an obvious aesthetic energy without assuming recognizable form or meaning. Fleeing as a pacifist during World War I to neutral Switzerland, the German artist Christian Schad became closely associated with the Zurich Dada, and later with the New Objectivity movement. His atmospheric portrait and genre paintings depicting life in interwar Europe are some of the best-known artworks of the period, and are often referred to as "Magical Realist". Though Man Ray's work in the area of cameraless photography would become more famous, Schad's experiments with contact prints on photosensitive paper precede - and probably influenced - Man Ray's pieces. To create these images, Schad gathered together fragments of discarded paper, fabric, and magazines - often retrieving them from roadsides or trash cans - and arranged them on light-sensitive paper. The "Schadographs", as Tristan Tzara dubbed the results of these experiments, reflected Schad's Dadaist sensibility both in the use of everyday compositional materials and in their avoidance of generic boundaries and obvious representational content. In particular, Schad aimed to create images with jagged and asymmetrical borders "to free them from the convention of the square." Schad was the first photographer to employ the photogram for artistic purposes. Though he remains a more obscure figure than Man Ray, his work had an enormous impact on the development of abstract photography. Within a few years, both Man Ray and László Moholy-Nagy were developing their own versions of the technique pioneered by Schad. In Man Ray's iconic work from 1922, a spring is captured in reverse-silhouette, extending diagonally upwards across the frame. In the center of the image, a white circular ring frames a glowing bulb, while to the upper left, several smaller circular shapes seem to cascade downwards. A strong sense of asymmetrical composition is brought to bear, as a result of which the formal relationships between the object - the distance between them, their relative depth within the impied space - becomes enigmatic. These effects are typical of the Rayographs which Man Ray produced during the early 1920s. Like Paul Strand, the American artist Man Ray's prolific portfolio as a photographer extends across both abstraction and portraiture. He was also a notable sculptor and painter, with ties to the Dada and Surrealist movements. His preferred props for the Rayographs were mass-produced consumer items, giving his work a found-object feel typical of the Dada movement, and a proto-Pop Art energy. The striking graphic effects of the Rayographs led to their use in commercial fashion magazines such as Vanity Fair, and for advertising purposes in Harper's Weekly. A Parisian electrical company even commissioned a number of Rayographs to promote the use of electricity. As the art critic Benjamin Genocchio notes, "[i]n these images the artist depicts the high-tech futuristic commodities of his time - toasters, electric fans and the like - in poetic ways." It was the contemporary energy of his work, and his willingness to explore new technologies with an aesthetically enquiring mind, that made Man Ray such an influential figure within abstract photography and modern art. 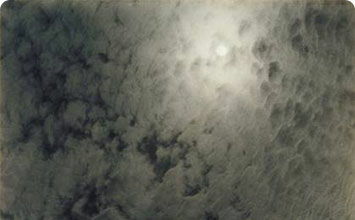 A dark, cloud-mottled sky fills the frame of Alfred Stieglitz's Equivalent, which was a photograph from a series with the same name. Lit by a glowing, moonlike sun to the upper right, the image takes on the quality of pure abstraction as the billowing patterns of light are emphasized, and any reference to a horizon-line disappears. All sense of time, location, or context is also absent, leaving the viewer free to ponder the visual qualities of the work, and the inner feeling or mood they evoke. The gallerist, critic, and artist Alfred Stieglitz (husband of Georgia O'Keeffe) was perhaps more influential than any other figure in championing the cause of modernist photography during the late nineteenth and early twentieth centuries. Stieglitz's own creative ventures included founding the influential 291 Gallery, one of the first to exhibit European avant-garde art in North America. In his own work, Stieglitz was influenced by Wassily Kandinsky's assertion that colors and forms corresponded to "vibrations of the soul," a much-discussed topic during artists' gatherings at the 291 in the 1920s. Art critic Hilton Kramer emphasizes the influence of the European avant-garde, and of American Precisionist painting, on Stieglitz's work, noting that the Equivalents "undoubtedly owe something to the American modernist painting (Dove's and O'Keeffe's especially) that Stieglitz felt particularly close to at the time." Stieglitz's images had a significant impact when first exhibited, and would later influence photographers such as Ansel Adams, who described seeing the Equivalents as his first "intense experience in photography." Art critic Andy Grundberg argues that the Equivalents "remain photography's most radical demonstration of faith in the existence of a reality behind and beyond that offered by the world of appearances. They are intended to function evocatively, like music, and they express a desire to leave behind the physical world". In this photogram from 1926, a curvaceous, glowing white shape floats against a rich black background. The abstractness of the form erases all explicit representational content, but part of the interest of the work lies in the competition between claims of identification which it establishes, as various figurative reference-points are suggested by different parts of the composition. In particular, the central white shape might suggest a face in profile. Influenced by the Northern-European strain of Constructivism associated with the Bauhaus - where he taught for several years - the Hungarian artist László Moholy-Nagy believed that photography could revolutionize modern vision, allowing the artist to assume a new, mechanically objective gaze upon the world. His 1925 book Painting, Photography, Film deploys examples from scientific, journalistic, and amateur photography to show how the medium had revolutionized modes of seeing. The artist began creating the cameraless images that he dubbed "photograms" in 1922, placing objects on photographic paper which was exposed to light. As art historian Sylvie Pénichon notes, "he pushed the envelope" by his experimentation with materials, using transparent or translucent objects, and applying graphite, varnish, and other substances to his prints. To create this work - whose alternative title, Self-Portrait, emphasizes its figurative suggestiveness - Moholy-Nagy pressed the side of his face against the print, inserting himself into the composition process in a gesture of spontaneous, whimsical irony. Moholy-Nagy once described his practice as "the shaping of light". As curators Ute Eskidsen and Alain Savag put it, "[t]he photogram is not a copy but a transmutation of the real and, first and foremost, of the phenomenon of light [...] The abstraction of the photogram is thus deliberately linked to the pictorial issues of the day." Moholy-Nagy's work has influenced a whole range of subsequent photographers, including contemporary artists such as Barbara Kasten, Walead Beshty, and Wolfgang Tillmans. A sharply-focused close-up image of a wall covered in peeling layers of paint, this 1949 photograph by Aaron Siskind exemplifies the way in which abstract photography began to interact with the development of Abstract Expressionist painting in North America following the Second World War. Like the work of the New York School painters, this image offers an all-over play of abstract motifs within a flattened pictorial space. The dark layers of textured paint peeling up through the center of the image, emphasized by smaller dark areas around the edges and receding into lighter surrounding areas intersected by fine networks of lines, indicate a strong compositional impetus. The New York-based Siskind worked as a school teacher for several decades before taking up painting relatively late in life, becoming closely associated with the new movement in abstract painting which emerged in New York during the 1940s. Around the start of that decade, Siskind began taking close-up photographs of found objects, emphasizing abstract patterning and shape in a manner that was initially influenced by Straight Photography. He was increasingly drawn, however, to the work of Abstract Expressionists such as Franz Kline, Adolph Gottlieb, Barnett Newman, and Robert Motherwell, and his work began to acquire a similar kind of surface-energy, suggestive of psychic conflict or inner mood. Of his own practice, Siskind stated: "[w]hen I make a photograph, I want it to be an altogether new object, complete and self-contained." Art critic Andy Grundberg notes that "the division we are accustomed to drawing between abstract form and concrete reality starts to dissolve in [Siskind's] photographs; what remains is ambiguous, recalcitrant and endlessly tantalizing." This sharply focused, richly-detailed image shows a geological formation, the Moenkopi Strata, in Capitol Reef National Park in Utah. The image is isolated from its context, so the irregular forms and dynamic interplay between light and shadow become abstract compositional motifs. Due to the uncertain vantage point, the viewer might also wonder if this is an aerial view or a side view. As a result, the elements of rock formation become fluid, while the gaze is drawn to various figuratively suggestive areas such as a long, bone-like flank of rock, and another clenched like a human fist. Because these forms are natural, their textures, fissures and fractures become powerfully suggestive of human emotions. Born in 1908 in Minnesota, Minor White, Like Aaron Siskind, represents a younger generation of abstract photographers, inspired by the pioneering experiments of Stieglitz, Coburn, and others. Steiglitz's Equivalents in particular were a great influence on White, who once stated: "[w]hen a photographer presents us with what to him is an Equivalent, he is telling us in effect, 'I had a feeling about something and here is my metaphor of that feeling' [...] that can direct the viewer into a specific and known feeling, state, or place within himself." For White, the natural objects he photographed - rock formations, beaches, fallen trees - were "only the objects upon which the significance is spread like sheets on the ground to dry." White's insistence on internal feeling and spiritual meaning has given his work an almost cult-like appeal to some, while others have criticized his esotericism. The art historians Peter S. Bunnell argues that "White [...] forged a new photographic approach: one that blended the hard formalism of Western taste with the more subtle and intellectual stance of the East Coast," making him "one of the most important photographic artists active during the thirty years after World War II". Barbara Kasten's Polaroid image from 1983, part of her Constructs series, depicts various luminous planes of glass. Two white spheres appear in front, their shapes reappearing through the refractions and reflections created on the surrounding colored surfaces. A tangible sense of materiality is generated, while at the same time, the distinction between solid material form and mere shadow-play dissolves. With reference to such works, Kasten has described her "fascination with light and its inevitable companion, shadow." Born in 1936, Barbara Kasten trained as a painter and textile artist before turning to photography in the 1970s. The first result was her Amalgam Series (1979), a set of black-and-white photograms influenced by Moholy-Nagy. As Kasten puts it, "[t]he process of making complex shadows led me to photograms, which were the entry point of my photographic career [...] the negative-positive photogram allowed me to explore the illusionist properties of photography with tangible sculptural materials and constructions." Expanding on these experiments in the 1980s, she began her Constructs series, of which she has written: "[t]he sculptural constructions used to create large-scale photograms inspired studio installations. Referencing constructivism, the temporary theatrical tableau are made to be photographed in approximately 4 to 8 feet square spaces." Working with the legacy of Constructivism and Concrete Art, Kasten creates abstract sculptural environments whose dimensions and formal qualities are both extended and rendered ambiguous by a photography process which generates mirages, shadows, and illusory spaces. As the critic Piper Marshall notes, "[t]hese photographs offer an architecture that takes in the expired ideals of their historical forebears to expand them outward, splaying their shadows into a transitional space." This enigmatic image from Hiroshi Sugimoto's celebrated Seascapes series shows an ocean view bisected almost imperceptibly, by a horizon line which seems to disappear at the very moment we attempt to focus on it. In the bottom third of the image, the dark, regular furrowing of the waves draws our gaze, while moving in and out of focus. The result is a powerful, semi-abstract image, evoking the sea as a kind of elemental, archetypal presence, sublime but undefinable (even while the title places the image in a particular geographical location). Born in Toyko in 1948, Hiroshi Sugimoto has become famous for his long-exposure images, and for exploring single subject-matters over extended series of photographs. He began creating his Seascapes in 1999. Each image in the series depicts a particular place, and is dated to a particular time, but each is identifiable only by elementary qualities of light and atmosphere. The series offers a subtle, self-reflexive commentary on the nature of looking and thinking, as our eyes and brain attempt to fill in the visual details of the images, rendering our engagement with the work an act of creative perception. Sugimoto is amongst the most celebrated of contemporary abstract photographers, particularly for this series. The photo editor Myles Little has described Sugimoto as "one of the great photographic masters of our age," calling his work "awe-inspiring" for its ability to capture moments of timelessness. Influenced by the color-field painting of Mark Rothko and Morris Louis, this 2008 work by British-American artist Walead Beshty consists of multiple bands of color, extending at irregular angles across a vertically aligned frame. Drawing the viewer in with its suggestions of energy and movement, the image repels our gaze as we attempt to find a secure foothold or fulcrum around which to arrange the composition. Beshty began making photograms in 2005, following a conversation with the grandson of László Moholy-Nagy, who referred to a number of lost Moholy-Nagy artworks created "using nothing more than crumpled photographic paper". Inspired by this idea, Beshty created his 2006 work Abstraction Made by My Hand with the Assistance of Light by crumpling up photographic paper and exposing it to light. To create the image above, he curled photographic paper in the darkroom before exposing the warped sheets to cyan, magenta, and yellow light, creating light-and-shade patterns on the surface of the paper using the edges of the paper itself. Beshty has described the results of such experiments as "multiple tracings of a three-dimensional object [...] both a depiction of the photographic paper and the paper itself, as the paper casts an image of itself onto itself through the exposure process." He has also argued that such works are "[c]oncrete photographs (with a lower case 'c'), not abstract or pictorial photographs," because "the viewer is always presented with the referent and the image at the same time." As art historian James Nisbet has written, "Beshty's art nonetheless remains utterly of our own historical moment, presenting [...] so many possibilities leading to so many indecisions." This installation work by contemporary New York-based artists Liz Deschenes consists of six unique, black-and-white photograms arranged in a ring around an imagined viewer who would stand in the center of the room, offering them a 360-degree immersion in the images. Through their dynamic placement, the photograms take on something of the quality of domestic architectural features, surrounding the viewer like the tiles on the floor or vertical panels which divide up the gallery, altering our physical engagement with the space as a whole. Deschenes works with post-minimalist and post-conceptual themes, often creating works as cues or spurs to a physical or conceptual process which is itself the true 'art-work'. To create these photograms, she exposed photosensitive paper to moonlight over an extended period of time, bringing out the images using silver fixer in the darkroom. Each of the panels thus has a silver tone, full of subtle variations, seeming like a pool or mirror of moonlight. The artist's intention was to surround the viewer with these images at every conceivable turn of the head from a particular position, an idea inspired by the graphic designer Herbert Bayer's 1935 diagram showing a theoretical "full field of vision". Writing in the New York Times, art critic Martha Schwendener has described Deschenes as "one of the quiet giants of post-conceptual photography", arguing that in works such as Tilt/Swing, she is "increasingly engaged with the legacy of minimalism." Her unique contribution, however, is that "'[p]hotography' in her hands becomes immanently material, with images, stereoscopes and other devices structuring our experience as concretely as the architectural spaces in which they are displayed." Wolfgang Tillman's large-scale image evokes complex figurative associations while remaining abstract in form. The mobile ripples and shapes which fill the frame, in varying tones of blue, become variously and enigmatically embodied: hair-like, body-like, resembling water, yet evading any precise contextual definition. The only non-British recipient of the prestigious Turner Prize, the German photographer Wolfgang Tillmans has worked across a range of photographic genres, including portraiture and landscape photography, but has explored abstract idioms since the 1990s. He began his Freischwimmer series in 2005, naming it after the German classification system for swimming proficiency. Created on a monumental scale perhaps inspired by the large-scale canvases of Color Field Painting, the Freischwimmer photographs generate an all-encompassing visual atmosphere, notable for its associations of meditative lyricism. As if to emphasize the enigmatic quality of the pieces, the artist has not revealed the process used to create them, beyond indicating that they are contact prints made in the darkroom, with photo-sensitive paper exposed in stages and three-dimensional objects used to create various effects. Of the distinctions between his different photographic styles, Tillmans has stated: "[i]n a way, abstraction is something that I have always done [...] this exploration of the image surface, of the very nature of what constitutes an image, has always been of great fascination to me, how in a way it's all just a likeness and never the real thing, but also how something you mark on paper is transformed into something that you look at and see something else in". As Matthew MacLean writes, "[e]ven when [Tillmans] eschews representation, working without cameras, the results [...] are a numinous sublime."